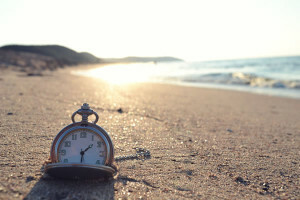 Most people understand ‘time is valuable’ in theory, but they not to apply it in their daily lives. However, the few who embrace it wholeheartedly make their lives extraordinary. Effective use of daily time. These two pieces go hand in hand. Without planning or top-level decisions about time and priorities, we never know what the best use of our time is on a daily basis. And without attention to how we use our time every day, we can never realize our plans or make progress toward our goals. Most people drift along in life without a plan, often sprinkling in some short-term goals like paying off a debt or changing a job. There isn’t any progress or growth beyond sporadic, small milestones to define one year from the next. “Last year we took a trip”, “this year we bought a car”, “next year we’ll paint the house”. In this way our lives are essentially like waves lapping the shore, repeating over and over. The years may look or feel a little different each time, bigger or smaller, crashing louder or softer, but they are basically waves on a beach when we have this mindset. Without longer-term planning or goals, procrastination reigns, as there’s no urgency tied to life’s real deadline – our expiration date. The days just continue to loop over and over, so really what’s the difference between doing it today or in a few days…they’re all pretty much the same day anyway (with a different name). Without a roadmap, life comes at us, often in unforeseen and tragic ways. And it’s not just the big stuff – small problems happen more often when we have no longer-term view. Things are neglected, and simple problems that could have been avoided are not. Life without a longer-term plan or decision-making often sounds like a list of temporary updates by frightened people. “The weather is okay today”. “I feel okay today”. “Things are good right now”. Until a disturbance comes along…and then it’s all about trying to get back to ‘normal’ again…waves crash and recede…. The purpose of top-level, longer-term planning or decision-making is to define how we want to live our lives. And when we actually define our desired outcomes in life – specifically, not vaguely – it’s 1000% more likely that we will get the results we want. Rather than a daily/weekly/yearly cycle, life becomes a straight-line continuous process, each day a further step along in a journey toward a defined destination. Obstacles are faced and overcome with a purpose, not a desire to revert back to some normal state. And since long-term planning requires looking ahead, challenges are anticipated. Tools, resources, bodies, minds, relationships, ideas, are all vital in order to get where we’re going, and therefore they are well cared for – well-maintained rather than neglected. This results in fewer problems of any kind – big or small. And when obstacles do arise as expected, we’re prepared (and have a reason) to not only resolve them quickly – but learn from them so as not to repeat them. Problems themselves are seen with a longer-term view, and we get better and better at rising to challenges. This allows us to reach for bigger goals. In this way, problems themselves ENABLE progress, rather than hinder it. How we spend our days is really where the rubber meets the road in life. Goals and planning can seem lofty and hard to get our arms around, but everyone can answer the question “how was your day?”. And the answer to that question – even the asking of it – is rooted in the cyclical mindset. How was today different than yesterday? Certainly tasks were completed, chores done. Perhaps some progress was made on a short-term goal or two. But without a direct tie to a longer-term plan, we always end up spending time on things that do not matter. What’s worse, that’s time we have forever surrendered being able to spend on things that DO matter. Keep in mind that this is not about spending time on things of value, like work, family or health. This is an important distinction. For example, a business-owner spending time working at their place of business is time spent with value, for sure. But it’s far from the smartest, most effective way to spend their time. They are much better off working ON the business itself, helping it grow and succeed longer-term. Take personal finance. Clipping coupons is arguably a valuable way to spend time. However, tracking spending in a budget or planning investments is a vastly more effective way to spend time if your goal is to increase your bottom line. So it’s not just about spending time on things that are of value to you. That’s important, but it’s not nearly as important as doing the ‘right’ things if you’re interested in getting where you want to go in life. The best use of time does both – focuses on important things, and does them smartly, even on a moment-to-moment basis, in order to get the results we want in life. And since our reality is that we have a fixed amount of time in which to live, it makes sense then that the best use of our time is an effective use of our time – directed at moving us closer toward the life we wish to live, not further from it. And those are the only two directions. An effective day is a thoughtful day, with activities in sync with our longer-term goals, and plenty of flexibility for exploring, ideas, and room for life to unfold. This means looking at each new day as a chance to continue the next steps along our journey, with time to enjoy and take pictures along the way. It’s about plotting a course, taking the wheel, allowing for course corrections along the way, and keeping our eyes on the destination in the distance. It certainly doesn’t mean that you have control over everything in your life. But it does mean that you take control of what you CAN control – which is actually an amazing number of things (here are just a quick 50). It’s all about connecting our daily actions with our longer-term goals. Without a goal or purpose, there is no growth, and life without growth is very hard to distinguish from simply running out the clock. Of course life is not about living only for the future. Life is lived in the now. But, it’s also true that our ‘now’ is something that is continually being redefined by our actions. Spend all of our money ‘now’ and very soon our ‘now’ will be all about figuring out how to live with no money! And on the other end of the spectrum, time is just as foolishly spent solely in pursuit of long-term wealth and dying from exhaustion one day with a billion $ in the bank. There is obviously a balance. But, the best balance is skewed more long-term. This is because life unfolds forward, and because we have a hard time seeing time in our lives. Time is just a concept, and an elusive one at best. “Time flies”, “Would you look at the time?”, “Where did the time go?”. And the mechanisms that rule our lives are just as elusive and hidden – a year’s worth of choosing a donut instead of an apple, 10 years of ignoring that lump, 20 years of not getting around to reading a book to improve a skill. These things all catch up to us without much notice. The great secret here is that while just a little neglect and short-term thinking can have a (negative) impact, it also takes very little in the way of improving focus, planning, and effective daily life to realize exponential jumps in results, in a very short period of time. In fact, a real winning strategy would be learn to align your daily choices with what brings you both long-term results and short-term happiness. Love exercising. Love eating healthy foods. Love spending time growing with family/friends. Love your work. Love learning. Love doing the laundry. Love paying taxes. Love everything you do, every day. And if you can do that, you have truly learned to live every moment of your life.